CloudByte, a provider of ZFS based storage software and appliances that recently created an open source project called OpenEBS delivering 'Containerized Storage for Containers', today released ElastiStor 2.0. 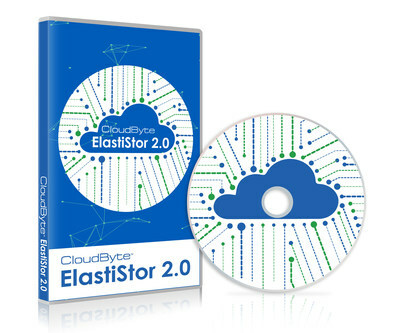 ElastiStor is primarily used by enterprises and service providers seeking QoS control for their private cloud, and large capacity backup and archive use cases. Mike Prieto, Senior Director, APAC sales, at Micron Technology (MU) said, "Together with CloudByte we are having great success at some demanding customers including a global EDA services firm. This user's workloads are extremely intensive and when deployed as an all flash appliance, the ElastiStor QoS controls and other capabilities have performed well and built user confidence. We at Micron, congratulate CloudByte for the release of ElastiStor 2.0 and for the overall progress at the company." A refactored user interface that saves time for storage administrators and accommodates new capabilities such as greater detail over the establishment and monitoring of per volume QoS policies which now better respond to read / write ratios, block sizes and other usage patterns. A fundamental reworking of the way in which ElastiStor addresses disk failure that can accelerate disk replacements by as much as 10x; this effort also eliminates the risk that single disk latency could impact overall system performance. This work addresses two of the primary complaints with ZFS based storage systems and improves the resilience and manageability of ElastiStor based systems. The addition of write once, read many support for backup and archive use cases. A variety of optimizations for today's hardware, such as 25-30% better performance for all flash use cases as well as the use of advanced multi-threading to improve performance in cases in which a large number of file access sessions via NFS have been established. Other capabilities include improved performance of high availability capabilities, which leverage the innate virtualization of the ElastiStor storage controllers, to better support non-disruptive upgrades. "The software defined storage solutions are now highly sophisticated and offer enterprise-class storage capabilities at affordable prices. CloudByte is in the top-end of such storage providers, forging new ground in low-cost, high performance solutions," quoted Johan Blomgren, CEO of MeraIT Stockholm. CEO of CloudByte / OpenEBS, Uma, said, "2017 is proving to be a record year for CloudByte. This release, coming right on the heels of the creation of our OpenEBS, an open source project, is due to lots of input from our customers as well as our high performing engineering team." In addition to ElastiStor 2.0, CloudByte is making generally available two new all flash-appliances powered by Micron storage optimized flash. These appliances leverage higher performance and a more scalable SAS backplane to deliver larger capacity and higher density all flash systems. CloudByte is the creator of the ElastiStor virtualized file and block storage appliance for private cloud, backup and archival use cases as well as the originator of the OpenEBS.io, an open source project delivering Containerized storage for Containers. CloudByte was founded by a team of proven enterprise storage engineers in 2011 and is backed by top tier investors including Nexus Venture Partners and Eight Road Ventures, formerly known as Fidelity Growth Investors. In early 2017, Evan Powell, founding CEO of Clarus Systems (RVBD), StackStorm (BRCD) and Nexenta Systems, an early leader in open storage, joined as Chairman of the Board. For more information please visit http://www.cloudbyte.com or http://www.openebs.io.